"There will be a Memorial Service for Susan on Saturday, May..."
PALO ALTO, Calif. - Susan "Sue" Jacques Pines died on Jan. 28, 2019, 93, in Palo Alto, Calif. Sue was the ninth of the 11 children of Lancelot Jacques and Margaret Nicodemus Jacques of Smithsburg, Md. She is survived by her son, Jack; daughter-in-law, Susan; six grandchildren (Karen Day, Jason Blaisdell, James Blaisdell, Merrick Blaisdell, Margaret Porto, Stephen Pines and Julia Garapon) and eight great-grandchildren.Sue trained as a nurse at the Washington County Hospital in Hagerstown, Md., and had advanced training at Columbia University. She met her husband, Dr. Philip Pines at the Washington County Hospital. In 1952, Dr. Pines set up his medical practice in Limestone, Maine, where they lived and raised their children, Jack and Judith; Sue was the office nurse. Dr. Pines died in 1975 and their daughter, Judith Pines Blaisdell, died in 2014.Sue was active in civic affairs in Limestone and in Aroostook County. She was the first female member of the Limestone Rotary, and the first female state legislator elected from Limestone. Her activities included the Limestone Historical Society, the Girl Scouts, the Limestone Library, and the Limestone Republican Committee. When Loring AFB closed, Sue was a leader of the group planning for the future of Limestone and setting up the Loring Development Authority. 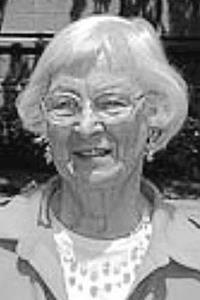 She was an early supporter of the Maine School of Science and Mathematics, both with funding, legislative support and even hosting some of the first students.Sue was instrumental in helping to set up the Pines Health Services, now a large Federally Qualified Health Center in Northern Maine with some 150 employees which was named after the late Dr. Pines. She was on the Board of Cary Medical Center, Caribou, from 1995-2000.After retiring from the legislature, Sue lived at the Granite Hill Estates in Hallowell, Maine, until moving to Palo Alto in 2016 to be closer to her son, Jack. At Granite Hill, she had many wonderful friends and participated in church and social activities, as well as keeping up with her grandchildren.A celebration of her life will be held at Cox Memorial United Methodist Church, Hallowell, Maine, on Saturday, May 4.In lieu of flowers, donations can be made in Sue's memory to either Cox Memorial, the Limestone United Methodist Church, the Robert A. Frost Memorial Library in Limestone or the Maine School of Science and Mathematics.